Jorma Hynninen - surely the finest baritone in the generation after Fischer-Dieskau - is without peer in such repertoire, and he does a marvelous job with these little gems. Järnefelt is a name to conjure with for any Sibelian or Finnophile. (...) Nylund's rhapsodic 'Sing, sing!' (...) embodies Finland's supreme way of articulating emotion. 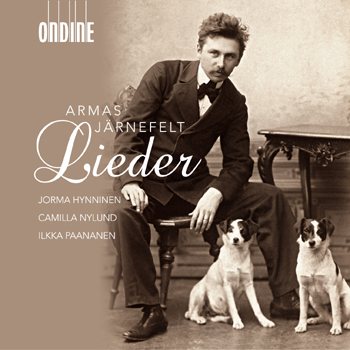 This CD features baritone Jorma Hynninen (tracks 1-11) and soprano Camilla Nylund (12-22) with solo songs by Armas Järnefelt (1869-1958) who was a brother-in-law of Jean Sibelius. His slightly over sixty solo songs form a notable segment of Finnish National Romantic vocal music and are characterized by their use of melody, cantabile, colourful harmony and a Nordic freshness and lucidity. While his early songs are wholly grounded in folklore, his later output imports Impressionism and even Expressionist tones. This recording was co-produced by the Armas Järnefelt Society.